The economies of the industrialized nations of the West typically require a strong labor force to make products and provide services for business prosperity. These economic realities have become more prevalent in the United States in recent years, particularly in New Jersey and New York, where the labor force has increased due to increased labor demands, particularly in the commercial and residential construction industries. Workers on dangerous job sites in New Jersey too often suffer serious personal injuries from workplace accidents and are in need of attorneys who specialize in constructions accident cases. Unfortunately, the construction site worker is particularly vulnerable to workplace safety violations, non-compliance with federal, NJ and NY State workplace safety laws, and particularly the federal OSHA regulations. Masons, roofers, siding installers, carpenters, machine operators, general laborers and framers, to name a few, are vulnerable. As such they are particularly in need of an experienced construction accident lawyer licensed to practice law in NJ and NY. All too often employers take the position that worker safety is not important. As such, scaffolding collapses, ladder injuries, falls from roofs, explosions, unguarded machines and other dangerous work conditions cause serious injury and death. Representation by a qualified and experienced injury lawyer is necessary to compensate the injured worker and make our community safer. Those responsible for not following the federal workplace safety regulations like OSHA and related industry standards must be held accountable. Otherwise employers will feel free to violate the rules and endanger the public. Construction site workers, who are often working at heights of ten feet or more, suffer serious personal injuries on unsafe job sites. Some end up with brain damage, paralysis, in wheel chairs or disabled permanently. Construction site contractors that ignore OSHA and industry safety rules and worse, failing to provide workers compensation insurance, cause strain on societal resources such as hospital charity care funds, leaving everyone else to foot the bill. Under New Jersey law, an employer who fails to provide workers compensation insurance to an employee worker who has been injured in a construction accident faces criminal penalties for the violation. N.J.S.A. 34:15-79. This is akin to, but apparently more severe, than a driver who fails to carry automobile insurance. Contractors that choose to violate industry safety rules must be held accountable in Court to prevent this. 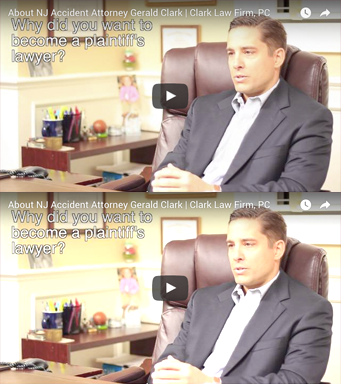 Gerald Clark is a New Jersey and New York construction accident lawyer and the principal of the Clark Law Firm, PC. The firm successfully represents injured workers who suffer serious personal injury on unsafe, OSHA non-compliant job sites. Clark has obtained many successful jury verdicts and settlements in these cases. If you have been injured in a construction accident on a work site in New York or New Jersey contact the personal injury attorneys at the Clark Law Firm, PC. The law firm has offices in Ocean County, Monmouth County, Essex County / Newark and Bergen County, NJ.